For almost as far back as I can remember, The Simpsons has been part of my weekly ritual. It premiered in 1989 with a Christmas special, and went on to become the TV sensation of the year. Within weeks, merchandise from the show was clogging stores everyone, from T-Shirts to crudely constructed plush toys. I'm sure most saw the show as a fad that would burn out quickly (catch phrases like, "Ay, carumba!" did little to quell those fears, I'd guess). Who would've thought that, 12 seasons later, the show would still be going strong? Recently, the same sort of profitable phenomenon has sprung up around other programs (South Park, for example), but it's unlikely that there will soon be another series with the same depth, humor, and longevity as The Simpsons. The first season of the show is traditionally one of the least popular among fans. The animation was crude, first of all, with the characters looking a bit off and the backgrounds lacking the fine detail and subtle touches that have become a hallmark of the series. These first shows are less outlandish, more character oriented, and more leisurely paced. The tone is closer to a regular sitcom, albeit a well written, subversive one. It wasn't until seasons two and three that the series settled into the satirical groove that gained it the reputation as one of the best television shows in history, but the first season episodes are still very entertaining, and essential viewing for die-hard fans. This collection consists of the entire 13-episode season, totally uncut and presented in order as originally broadcast. Discs One and Two hold 6 episodes each, while Disc Three has one episode and the extras. "Maggie is walking by herself. Lisa got straight A's. And Bart... Well, we love Bart." Though intended as a regular episode, due to production delays, this episode was repackaged as the series premier, and a holiday special. As a series opener, it's pretty good. Homer discovers he won't be getting a Christmas bonus, and gets a job as a department store Santa to help his family keep up with the Flandresses. There are some funny lines in this one, and classic moments from now familiar characters, including Patty and Selma. Real highlights include the first appearance of Santa's Little Helper (the family dog) and Homer's everlasting hatred of his neighbor. "Well, you're damned if you do, and you're damned if you don't." This episode was never a favorite of mine, and I had the misfortune of seeing it about thirty times in syndication. Still, on reviewing, there are some funny moments here and there. Bart, sick of being treated poorly by his teacher, cheats on an I.Q test and is transferred to a school for geniuses. Homer is achingly proud of his child's achievements ("You may accomplish something no Simpsons has ever done. You may outsmart someone. "), but Bart has trouble holding up the illusion. Memorable moments include a Bart test anxiety dream sequence, but the slow pacing lowers the overall score. Another so-so episode redeemed by memorable moments. Homer causes the first of many accidents at the power plant and is fired. After almost committing suicide, he decides to rededicate himself to making the world safe for others. He campaigns for safeguards all over Springfield, but his real target is the dangerous power plant. Though there is some funny material, including Bart fieldtrip hijinx and Homer's misguided attempts at community improvement, the shifts in tone harm the overall presentation (the suicide scenes are quite dark and jarring). Interesting, but there's too much going on. Features the first appearance of Mr. Burns and Smithers, sporting the wrong skin color.
" Dear Lord, thank You for this microwave bounty, even though we don't deserve it. I mean... our kids are uncontrollable hellions! Pardon my French... but they act like savages! Did You see them at the picnic? Oh, of course You did... You're everywhere, You're omnivorous. Oh Lord! Why did You spite me with this family?" If the first season produced a classic, this is it. Homer takes the family to the company picnic, and is thoroughly embarrassed when Marge gets drunk, Lisa swims in the fountain, and Bart causes more trouble. He decides to sell the family TV and take everyone to visit with Dr. Marvin Monroe, family therapist. Aside from the first appearance of Itchy and Scratchy, there is the unforgettable sequence where the family blacks out the city performing electroshock aversion therapy on each other. There are some nice emotional moments, and a true picture of the Simpsons as the dysfunctional family we all know and love.
" Ladies and gentlemen, boys and girls. Contrary to what you've just seen, war is neither glamorous nor fun. There are no winners, only losers. There are no good wars, with the following exceptions: The American Revolution, World War II, and the Star Wars Trilogy." Another very strong outing. Bart is picked on by bullies at school, and decides to form an army to stop them. He accomplishes this with the help of Grandpa, in his first appearance. Memorable moments include Bart rolling down the hill in a barrel (and coughing up his hat), Grandpa's sage wisdom, and bombardment by "Happy Birthday!" water balloons. A bit slow-paced by today's standards, but very strong overall. "Lisa! What did I tell you about playing that saxamuhthing in the house?" This episode is less enjoyable than the others, perhaps because of the more serious tone. Lisa feels sad, and she can't explain why. She feels oppressed by her father and brother and roped in by her suburban life. She then meets Bleeding Gums Murphy (ew! ), who teaches her that, through the blues, she can learn to cope ("You don't play the blues to feel better, you play to make other people feel worse."). The entire plot seems a bit rushed and underdeveloped, and I've always hated the Bleeding Gums character. Points for trying something with more substance, but this one doesn't cut it. "Ready or not, Nature, here we come!" This is a very strong episode, full of the outlandish humor that only an animated show could get away with. The Simpsons go camping, but Homer manages to drive their R.V. off a cliff, stranding them. Bart and Homer are separated, while Lisa and Marge build a camp. The "men" prove themselves to be rather inept outdoorsmen, and when Homer is covered in mud (in an attempt to escape some aggressive bees), he is mistaken for Bigfoot and carted back to Springfield as a scientific curiosity. 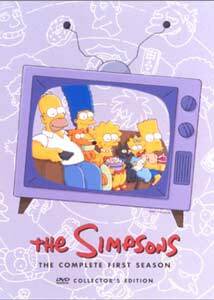 Some great scenes, including Maggie's interaction with a bear and Homer's attempt to snare a rabbit, make this one well worth revisiting. Bart: I was wondering. How important is it to be popular? Homer: I'm glad you asked, son. Being popular is the most important thing in the world! Bart: Like, sometimes, you could do stuff that you think is pretty bad, so other kids will like you better? Homer: Then run along, you little scamp! You know, the first season gets a bad rap, but as I go through these, I find myself enjoying the large majority of the shows. This one is pretty good. Bart overhears some of the "cool" kids at school talking about how awesome it would be if someone cut the head off of the statue of town hero Jebidiah Springfield (he killed a bear with his "bare" hands!). Bart, of course, does it, and the entire town is outraged at the vandalism. Bart must own up to his deeds and deal with his own guilt. There is some funny Homer dialogue here, and I quite like the flashback structure used (-"How long will this take?" -"Oh, about 23 minutes and five seconds."). Also features some of the better animation of the series thus far. Things are definitely improving, slowly but surely. "Augh, 239 pounds?! Oh, I'm a blimp. Why are the good things so tasty?" This is probably the funniest episode of the season, and it has some nice character moments as well. Bart gets a spy camera in the mail and is taking pictures of just about everything. Homer is at a bachelor party, so Marge takes the family out to dinner. It turns out to be the same place Homer is partying, and Bart snaps a picture of him stuffing money into a belly dancer's bikini. The picture circulates, and eventually gets back to Marge. She is furious, and insists that Homer teach Bart that women are more than just objects to be ogled. Matt Groening mentions in the commentary that Marge's rage over a rather timid picture is odd considering all the horrible things she has accepted from Homer later in the series, but this one is still a winner. Another contender for best of the season. Homer first forgets Marge's birthday, then buys her a bowling ball, even though she's never bowled. Furious, Marge decides to take up bowling to spite her husband, and she becomes involved with Jacques (guest voiced by Albert Brooks), a French bowling instructor. Brooks is remarkably funny as the Bowlarama Casanova, and his scenes alone make this one a classic, but then there's the scenes of Homer trying to keep things together at home, and that memorable ending homage to Officer and a Gentlemen. I guess you could say it "bowled" me over! HA! You could. I didn't say you should. "Comedy, thy name is Krusty." This is a very strong episode, especially when considered in terms of establishing the continuity of the series. Krusty the Clown, Bart's TV hero, is framed for robbery by his sidekick, Sideshow Bob. Bart doubts his guilt, and it's up to him and Lisa to clear Krusty's name. Of course, this was but the first in a long line of memorable appearances from Sideshow Bob (voiced by Kelsey Grammer). Also established is Lisa's place as the "smart one." There are also some great scenes involving the townspeople, especially the mass burning of Krusty merchandise. "See these? American donuts. Glazed, powdered, and raspberry-filled. Now, how's that for freedom of choice!" This is another pretty good one, and of all the episodes in the first season, it does the best job of matching the tone of wacky, satirical humor established in later seasons. Principal Skinner is sick of Bart causing trouble in school, so he asks Homer and Marge to enroll him in a foreign exchange program. They agree, and Bart is off to France. Unfortunately, he is sent to live with two winemakers who work him like a slave. Meanwhile, the student Homer and Marge take in turns out to be an international spy, unwittingly helped by Homer to gain access to the power plant. The Bart story drags a bit, but the spy plot is great, as is the payoff. Dr. Monroe: "Next up we have Marge. She's 34 and trapped in a loveless marriage." Homer: "Turn it up! I love hearing those wackos!" The final episode of the season was intended to be the first, but was delayed due to production problems. Perhaps the extra time helped, as it is probably the third best of the season. Homer and Marge try to have a nice night out, but they can't find a sitter who will watch the kids. Finally they find one, but she turns out to be a serial criminal! Lisa, Bart, and Maggie must put a stop to her thieving ways, using Home Alone inspired methods. Of course, Homer will probably manage to muck things up, as usual. Fans remember this one very fondly, and it has some great elements, including funny sight gags and lots of quotable lines. The tone of the show has changed since this episode first aired, but older isn't always worse, and this one holds up well. Image Transfer Review: While there are several small problems with the image quality on this set, I have to say that overall the episodes look better when compared to broadcast quality. The first season wasn't the best in terms of animation, and the increased clarity of DVD makes it easier to spot gaffes like color bleeding. Colors are eye-popping, but solid surfaces have a grainy, almost digital look. The most apparent problem is the aliasing visible on many horizontal surfaces�they appeared to squiggle, even when not in motion. However, the effect isn't too distracting, and might go unnoticed by most. It's hard to say which problems are a result of poor compression (if any), and which are a result of the source materials (this was the first season, after all). Still, a nice looking image, just not the best. Audio Transfer Review: Episodes are offered in either a 2.0 mix, or a 5.1 remix. The 2.0 mixes are very good, with a wide front soundstage and good balance between music and dialogue. The remixes are neat, but they are rather limited by the source material. Of course, it's nice to have the dialogue anchored in the center, and it is, again, clear and natural. The music fills out the mains quite nicely. Surround use isn't exactly frequent, but there are some instances of directional effects and even split surrounds. Of course, I suppose these instances could be called gimmicky, as they weren't in the original mix, and they do call attention to themselves. Still, not bad for something that was originally mixed in mono. Tracey Ullman short "Goodnight Simpsons"
Extras Review: I have to admit, the impressive list of supplemental material on this set had me excited, and the end result is a bit disappointing. Most of the extras can be fully digested in one sitting. On the other hand, there is some fun stuff here, and I can't complain, since I would've been more than happy with a bare-bones presentation. Disappointment may be to strong a word, anyway, because I was more than contented by the optional commentary tracks for each of the 13 episodes. The majority of the tracks feature series' creator Matt Groening and producer James L. Brooks, plus either the director or writers of the episode (often, both). These are simply a must for any Simpsons fan, and it is amazing how much detail these people are able to remember after 280 odd episodes. Comments range from pointing out hidden jokes and explaining references, to discussing overall changes in the tone of the show. They also spend quite a lot of time abusing themselves, and drawing attention to some of the errors they made. It might sound excessive to have commentary on every episode (I certainly thought so), but after listening to one, I simply could not stop. I've seen each of these episodes scores of times, and it was nice to have something new to experience. Housed on Disc One are three scripts, for the episodes Bart the Genius, Bart the General, and Moaning Lisa. These are worth a look for those who want to see how the material changes from the page to the screen, but I find it tiring to read large passages of text on a TV screen. Too bad these aren't DVD-ROM accessible. The rest of the extras are on Disc Three. First of all, hidden on the extras main menu is a news clip, vintage 1990, on the "Bart T-Shirt controversy." I remember when merchandise featuring Bart was all the rage, and though I never owned any, I always wanted some. Apparently so did other kids, enough to get the shirts banned in schools across the country. Considering how tame the shirts seem in retrospect ("Underachiever and proud of it" and "I'm Bart Simpson, who the hell are you?" ring a bell? ), the clip is actually quite amusing. The Never Before Seen Outtakes aren't quite as novel as I'd imagined, but they are still interesting. Basically, this is animation from Some Enchanted Evening that was deleted because it was, well, terrible. If you aren't aware, for most shows animated for television, what basically amount to detailed storyboards are produced in America, and then sent overseas to be "filled in" by Korean "animation factories." That is not to downplay the work of the animators here, as the storyboards are the blueprint for the show and some more complex sequences are done in the U.S., by hand. Anyway, these outtakes consist of the less-than-impressive animation that came back from overseas. It's quite horrific to watch, if only to imagine what might have been. If things hadn't improved once more material began to come in, the show might never have happened. Oh, what a world! Optional commentary is offered here from Groening and Brooks, and consists mostly of Groening saying, "Oh my god." Next up is an Animatic from Bart the General. With commentary from Brooks and Groening, this is a 2-minute look at the rough side of animation production. Another short one is a 6-minute clip entitled The Making of The Simpsons: America's First Family. This was taken from a longer documentary produced for the BBC. Subjects covered include the genesis of the program, the inspiration for several characters, and a short look at Simpson-mania. Most likely, this segment will be supplemented by clips on future collections of the series (at least, I hope so). Self-explanatory are the Foreign Language Clips. Wanna hear what Homer sounds like in Spanish? The Japanese interpretation of Marge? Clips are also featured in French, Italian, and Portuguese. Alternate audio is also offered in the form of about 4 minutes of improv from guest-voice Albert Brooks on the episode Life on the Fast Lane. The audio runs over a still gallery and is quite funny (and a bit risqu�). The Simpsons originated as brief shorts on the Tracey Ullman Show. One of those shorts, Goodnight Simpsons, is included here. The voices sound different, and the animation is crude, but this is still a nice inclusion. Unfortunately, due to rights issues, it is likely that no other shorts will be included on future sets. Finally, The Art of The Simpsons houses two still galleries. One, "Life in Hell," is simply one screen, a shot of the Matt Groening comic strip that first caught the eye of James Brooks. "Early Sketches and Drawings" is a collection of about 30 rough drawings, from character concepts to background designs. Also on this menu is another gallery, albeit hidden as an Easter egg. Just highlight the cover of Bart's comic book to see a gallery of magazine covers featuring our favorite family. On the presentation side, the packaging is quite nice. A thick cardboard slipcover holds an illustrated foldout. Seems pretty sturdy. I received a screener copy with no booklet or disc art, but I can only assume the final version will include both. The menu screens are static, no doubt to offer more room for the program, as 6 episodes (plus multiple language tracks) are packed onto each disc. Each episode has 6 chapter stops. As I said, an initially impressive offering, but somewhat lacking in substance. Still, the commentaries alone earn this one a good grade. The Simpsons is undoubtedly one of the best television shows of all time. Maybe the episodes in this first season set aren't as funny or well animated as those that followed, but they provide the groundwork that those episodes built upon. Plus, they are still very entertaining and often funny. So what if Smithers is black and Homer doesn't sound right? It's The Simpsons on DVD! Now hurry up and release more. One year a month should suffice.